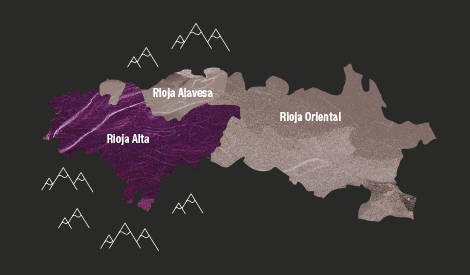 Rioja Alta is the westernmost area of the DOCa Rioja. Its grapes grow under the influence of an Atlantic climate and on a great variety of soils (clay-limestone, ferrous-clay and alluvial). Its numerous towns carry a long history full of emotions and feelings that has turned them into one of the main wine tourism options in the world, featuring, among many other riches, the largest concentration of century-old wineries in Europe and the world. The Haro Station District is a meeting point for all those who wish to enjoy the architecture of wine together with the history found in every corner of the many century-old cellars that treasure samples of their oldest vintages. Many of these wineries are still in the hands of the same families that settled in one of the first two Spanish cities to have electric street lighting in the late nineteenth century, shortly after Paris and London. “We are arriving at Haro, you can see the street lights” was often heard among travellers as they approached the town. Learning about the secrets of winemaking while tasting a good Rioja or chatting with a member of the fifth generation of winemakers is undoubtedly one of the greatest pleasures offered by Rioja Alta. The towns are distributed among the districts of Haro, Nájera, and Logroño and their names are heard across the world. They make a valuable contribution to area with their spectacular landscapes, environmental wealth, cultural diversity and an unparalleled passion for wine, capable of awakening the interest of anyone. Haro, Ollauri, Briones, Cuzcurrita del Río Tirón, San Asensio, Cenicero, San Vicente de la Sonsierra, Logroño and Fuenmayor are some of the destinations that hide in this wonderful zone located in the westernmost part of the region.